A year ago, one of the biggest pieces of prevention news at the Durban International AIDS Conference was the announcement that a large HIV vaccine efficacy study would start in South Africa. HVTN 702, now running, is only the eighth human vaccine efficacy trial ever run in the history of the HIV epidemic and the first since 2009. From this autumn, it will have company. 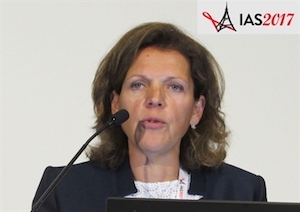 The 9th International AIDS Society Conference (IAS 2017) in Paris heard that HVTN 705 will start towards the end of this year. In this study, 2600 sexually active women aged 18-35 in South Africa, Zambia, Zimbabwe, Malawi and Mozambique will be given a candidate HIV vaccine or a placebo and then followed for three years to see if it stops them becoming infected with HIV. The HVTN 705 vaccine has been developed by Janssen, the pharmaceutical subsidiary of the giant drug and health company Johnson and Johnson. Whereas HVTN 702 grew out of the unexpectedly positive result of a previous vaccine trial in 2009, RV 144, the new vaccine has been painstakingly developed and refined during a number of studies conducted by Janssen. Both vaccines are 'prime-boost' in their design. This means that one or more doses are given of an initial ‘prime’ consisting of HIV gene fragments packed inside a shell of an inert, harmless virus – a so-called vector. The prime is then followed by a ‘boost’ that consists of proteins from the mature HIV viral particle. The boost may or may not also contain the prime vector. The rationale behind this design is that vectors have the machinery to act like real infections and can enter immune cells, ‘turning on’ their immune response to the viral components. Thus primed, the immune response is hopefully amplified greatly by the booster doses – to the point where, if a real viral invader appears, it is immediately recognised and neutralised. HVTN 702 consists of ALVAC, an HIV prime vector with a cowpox virus shell (from the same family as herpes and chicken pox), and a boost of the HIV gp 140 envelope protein. It is given as two primes injected a month apart, then four more injections of the vector plus booster protein over an 18-month period. The HVTN 705 design will be somewhat less onerous. It will consist of two doses of an adenovirus vector called ad26. Adenoviruses are a common viral family that are mainly known for causing colds, though the vector should not do that. This is then followed by two more doses of the adenovirus and a booster of the gp 140 envelope protein. Janssen’s Hanneke Schuitemaker told the conference that the vaccine for the new trial had been developed by Janssen during three separate trials, during which different components and combinations were trialled and the best picked. The APPROACH trial took place in 400 people in the US, Rwanda, Uganda, South Africa and Thailand and explored two different viral vectors using either the adenovirus shell or the shell of a type of MVA (Modified Vaccinia Ankara), another herpes cousin. In the trial, using the ad26 vector for both prime and boost shots proved to raise the best immune response. In a second trial called ASCENT, the choice was between different boost proteins – either ones consisting solely of proteins from HIV subtype C, the kind found mainly in southern Africa, or adding in a ‘mosaic’ of proteins from all the different viral subtypes. As HVTN 705 will only take place in Southern Africa, just the clade C boost will be used as it was not inferior to the mosaic boost in results from the 150 people in this trial, which was conducted in the US, Rwanda and Kenya. A third study called TRAVERSE has yet to issue its final results. This compares two different formulations of the prime vector and is taking place in 198 people in the US and Rwanda. When its final results are published around October, the final determination of the composition of the HVTN 705 vaccine composition will be made. However, the decision to go forward has already been made, as APPROACH was the crucial “Go or no-go” trial used to determine if a phase III efficacy trial should go ahead. Criterion 1: More than 90% of people given the vaccine mounted the so-called IgG antibody reponse to HIV clade C.
Result: More than 92% of people mounted such a response. Criterion 2: More than 56% of people showed a cell-killing antibody response to HIV clade C called ADCP (antibody-dependent cellular phagocytosis). Result: After all four doses, 65% of people mounted this response. Criterion 3: Over 50% of people should show a positive immune response to a pool of HIV envelope proteins, using the ELISPOT assay . Result: After four doses, 80% of people had an ELISPOT response. Criterion 4: The two booster doses should multiply the existing immune response caused by the prime to HIV envelope protein by at least 50%. Result: After four doses, the response was magnified nearly sevenfold – 590%. Criterion 5: Computer modelling from monkey studies showed that the magnitude of the immune response as measured by two different assays, ELISPOT and ELISA, needed to exceed a certain threshold in order for a 60% reduction in infections to be achieved. The criterion was that at least 40% of subjects had to achieve this after the third inoculation, and at least 60% after all four. Result: After three doses, 64% of subjects passed this threshold and after four doses, 80%. The main analyses of the results will be at seven months after the first shot (just after the third one), at two years, and at three years. Assuming HVTN 075 does start this autumn, this indicates that the trial will finish, if all goes as expected, in late 2020, with results available in mid-2021. South African researcher Glenda Gray, who provided an overview at the symposium, said that in some countries, including her own, HIV diagnoses were continuing to increase despite considerable increases in the proportion of people on treatment; South African HIV diagnoses had risen by 30,000 a year between 2010 and 2015, despite HIV treatment coverage increasing from under 20% to nearly 50%. This showed how urgently necessary an HIV vaccine was. The challenge would to be to make a simple one that provided long-term efficacy. She was optimistic, however, that the vaccine research pipeline was on the right path. “I feel we have reached a pivotal moment in HIV vaccine development,” she said.